The Terminal ePayment Exception Report displays a listing of all EMV payments, made in the last 7 days, that have not been linked to a Family record. This report is located in the Transactions / Financials section of Find Reports from the Reports menu. You can also use a keyword search "terminal ePay" to bring it up. When you process a terminal EMV payment, part of the process involves linking the terminal payment to a payment in the family's Jackrabbit account. Although unlikely, it is possible to get distracted while processing an EMV payment and forget to link the terminal payment to the payment in the Family record (steps #4-7 in Process an EMV Chip Card Payment in Jackrabbit). This is the tool to help you find and correct those unlinked terminal payments. It is a recommended best practice to run this report daily to ensure that all terminal payments have been linked to payments in your families' accounts. Unlinked terminal payments are only displayed for 7 days. To link terminal payments displayed in the report you will need to know which family's account the payment belongs on; the Terminal ePayment Exception Report does not display a family name. This is because the payment was never linked to a family and Jackrabbit does not know who it belongs to. If you are not certain which family the payment belongs on you can use the Family ePayment Listing Report to search for the last 4 digits of the card number. Click on the magnifying glass icon to search for the account record. Enter the family name to search and select and click the Pay button. 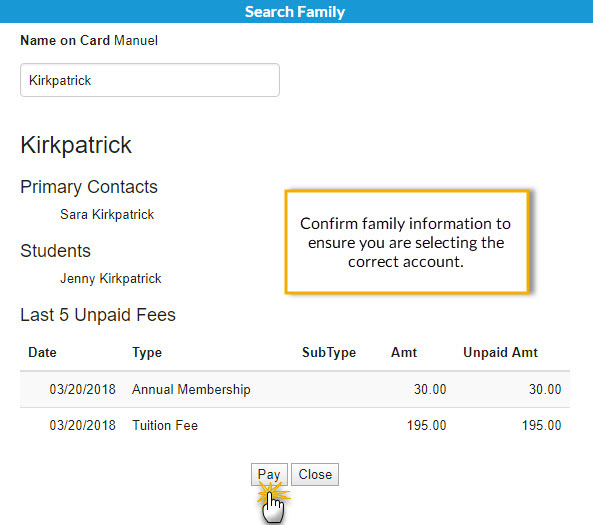 This will drop down information for the family (contacts, students, and last 5 unpaid fees). Confirm the family and click the Pay button. The Re-Apply Payment Transaction window will open, click to apply the payment and click Save Payment. You will receive confirmation that the payment has been linked (created and applied to fees), click Ok.